Underwood, a city that offers modern amenities as well as small town charm, is located in western Minnesota’s Otter Tail County nestled between Fergus Falls and Battle Lake on Highway 210. Underwood real estate is highly regarded for its value, number of home choices and scenic natural beauty. They say that once you come for a visit, you will want to stay for a lifetime! Underwood real estate is comprised of beautiful single-family homes and the market is noted for its strength and close proximity to nearby towns, lakes and local attractions like state parks and campgrounds. The region is home to several affordable neighborhoods that offer beautiful homes, safe streets and scenic views. A prime location in Underwood is the area around North and South Turtle Lakes. This property boasts prime lakeside views and easy access to nearby attractions and destinations. In the small city itself is a fabulous community of people looking out for and helping each other, guaranteeing utmost safety for its children. Underwood is proudly served by Underwood School District 550, named one of the top 100 school districts in the United States in 2007! The city is host to a beautiful school, known for quality educational offerings, an excellent athletic program, and a top-notch reputation. Underwood boasts a robust local economy that is home to a flourishing small business community as well as major employers in the region, such as Fergus Falls, just nine short miles away. The region’s economy is based on key growth industries such as tourism, education, and technology. Major employers include the Otter Tail County government, the Underwood School District and Park Region. Local attractions in Underwood include state parks, campgrounds, scenic forests and other public recreational and leisure areas. 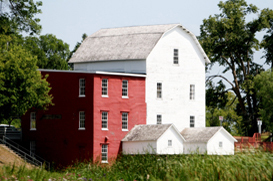 One place you cannot miss just north of Underwood is the Phelps Mill Festival held the second weekend in July. Located at the beautiful Phelps Mill, hundreds of artists, musicians and food vendors assemble for visitors to come and enjoy eclectic shopping, delicious food, and fabulous entertainment.